In today’s gospel passage, Jesus told us that those who are sent to spread the Good News are like sheep being placed in the midst of wolves. We are in a way defenceless because we renounce any use of violence. There are wolves out there eager to destroy us because, despite our message of love, justice and peace, we are seen as a threat to their activities and ambitions. 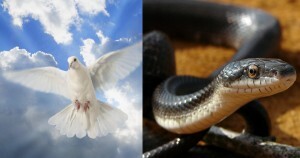 Jesus asked us to be clever as snakes and innocent as doves. In dealing with the world, we have to be creative; but innocent, but innocent, not in the sense of being naive but in the sense of being completely free of even any suspicion of wrongdoing. The end does not justify the means! As has happened so many times and continues to happen, followers of Christ, simply because they are his followers and for no other reason, will be hauled into court, will be the victims of intimidation and torture. This is our opportunity to give witness to Christ and everything that the Gospel stands for. When we are “handed over”, Jesus asked us to not be anxious what to say. We can see from the Acts of the Apostles that when the disciples were arrested and interrogated, they did not think about what to say, and very often their fears disappeared. The last words of Jesus in this gospel passage are sad because they are true. The following of Christ can break up families. I cannot obey a father who tells me to violate the Gospel; I cannot cooperate with a brother who urges me to do evil. It involves painful choices but the opposite would be, in the long run, worse. Jesus said: “When they persecute you in one town, flee to the next.” He never asks us to seek persecution. But when we can run no further, we have to take a stand for the gospel, and not compromise.